​CSHT can only run thanks to a willing army of volunteers who do everything from building the fences, hanging out the signs, making sure the scores get to the scorers and - perhaps most importantly - making sure the "bun run" runs on time! Can you spare some time to help us make the event run as smoothly as possible? We would love to hear from you if you can give us a few hours, or even a full day of your time, either before or during the event. Please don't worry if you've never done this before, or don't think you know enough (or anything!) about horses, come along and become part of the team - we'll give you a full briefing, all the necessary equipment, and our catering, with your help, is second to none! 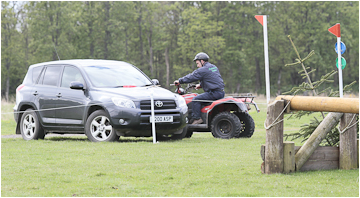 In the week before the event: we need people to clear the course of debris, paint the jumps, rope off courses and crossing points, set up dressage arenas, number fences, put up signs and so on. Even a few hours help makes a huge difference. On the day we need an army of jump judges, as well as stewards for dressage and showjumping, and people to write for dressage judges. And if you have a Quad Bike driving certificate and understand a wee bit about horses we'd especially love to hear from you if you could help collect scores for us. If you've any queries then let us know and we'll be in touch to explain a bit more.